Ali was an Associate at the law firm of Hogan Lovells US LLP. She also worked for Islamic International Arab Bank. She worked with Foreign Aid Conventional Financing and Shari’ah Compliant Student Loan Programs. Islamic banking refers to a system of banking or banking activity that is consistent with the principles of Islamic law (Sharia) and its practical application through the development of Islamic economics. Sharia prohibits the payment or acceptance of interest fees for the lending and accepting of money respectively, (Riba, usury) for specific terms, as well as investing in businesses that provide goods or services considered contrary to its principles (Haraam, forbidden). While these principles were used as the basis for a flourishing economy in earlier times, it is only in the late 20th century that a number of Islamic banks were formed to apply these principles to private or semi-private commercial institutions within the Muslim community. Notice that this tenant of Islamic law applies to Muslims, not infidels (those outside the Islamic faith). The Islamic International Arab Bank “commenced its banking operations in accordance with Islamic Shariah rules on the twelfth day of Shawal 1418 AH, corresponding to 9 February 1998, to meet the growing demand for Islamic banking services and products.” Zombie goes into more depth concerning Shariah finance and it is well worth a read. This is a practice that the Islamic world has been trying to institute in US finance circles for the last 10 years or so that I know of. I’ll be blunt… It seems to me that Obama is giving Muslims more access to the powerful elite circles within the White House than he is Christians, Jews or anyone else. In fact, in my opinion, he has all but declared all out war on Jews. His actions are anti-semetic to put it plainly. When the leader of the most powerful country on Earth addresses the Ummah before he speaks to our strongest ally, Israel or before he even addresses Americans, that makes a strong statement. When he starts cuddling up to Middle Eastern states who have been and still are our enemies and instead attacks Israel, he leaves little doubt where his loyalties lie. So let me get this straight… Marxists, Socialists, Communists, Eco-Terrorists, Muslims, La Raza and a whole host of radicals are coveted by our President. Christians, Jews, patriots, military and Constitutionalists need not apply. I just want to make sure I know where the lines are drawn. WHY WOULD KERRY KENNEDY LIE ABOUT THE GULF OIL SPILL DISPERSANTS? CNN’s Campbell Brown conducted an interview with Kerry Kennedy of the RFK Center for Justice and Human Rights after Ms. Kennedy’s visit to the Gulf of Mexico where she discusses the headaches, burning eyes, sore throats, and nausea she and her team experienced, and the illness that local residents are experiencing. The startling dishonesty presented by Ms. Kennedy requires serious examination so that we can begin to question why false information is being given to the American people. Ms. Kennedy is wrong on two very important points. 1) She says BP will not reveal the names of the chemicals being used, and 2) BP made the decision to use those chemical dispersants. Let’s take a closer look. From our Government’s EPA website (http://www.epa.gov/bpspill/dispersants.html#list), we can see the listed names of the chemicals that are in the dispersants. *Note: This chemical component (Ethanol, 2-butoxy-) is not included in the composition of COREXIT 9500. Take another look at the EPA’s website. Only our Government can authorize the use of those or any other chemicals. The EPA has even updated their webpage to reflect their direction to BP to reduce the amount of dispersant they’re using, and Ms. Kennedy certainly knows that only our Government can authorize and direct the use of the chemicals, not BP. What are the tradeoff considerations being weighed regarding the impact of fish and wildlife when making decisions about the subsea use of dispersants? Dispersants are generally less toxic than oil. When considering the use of a dispersant in the deep ocean, the federal government weighs the effectiveness of the dispersant in breaking down the oil at such depths, the benefits of preventing the oil from rising to the surface and eventually hitting the shore where it is likely to do significant damage to birds, wetlands and aquatic life, and the long term impacts of the dispersant mixed with oil in deeper waters. We have a monitoring and sampling plan in place to track the movement of the oil and we reserve the right to stop the use of these dispersants at any time based on the results. Does EPA make a determination on the toxicity of dispersants before they are approved? EPA requires toxicology tests and reports for all dispersants that are approved on the National Contingency Plan (NCP) Product Schedule, the authorized list of dispersants. All determinations regarding the specific application or use of a dispersant are made by the Federal On-Scene Coordinator in charge of the response. The authorization given to BP to use the dispersant on oil present on the surface of the water included specific conditions to ensure the protection of the environment and the health of residents in affected areas. At this time, EPA and the Coast Guard issued a directive requiring BP to decrease overall volume of dispersant by 75 percent and to cease use of dispersant on the surface of the water altogether unless provided prior written authorization from the Coast Guard. The Unified Command will continue to monitor for the effects of this dispersant on the environment and we reserve the right to discontinue its use. The Coast Guard and EPA have authorized BP to use dispersants underwater at the source of the Deepwater Horizon leak. Have dispersants ever been used this much before? While dispersants have been used in previous oil spills, this is the largest application of dispersants at an oil spill response in the United States. Since the spill occurred, EPA and its federal partners have closely monitored any potential impacts of the dispersant including air quality monitoring by both planes and through mobile and fixed locations. Air sampling is geared toward looking for significant increases in airborne (volatile) chemicals. Although Ms. Kennedy correctly states, from her own direct experience in the Gulf, the symptoms and illness that is resulting from the use of the Corexit dispersants, why is she leading viewers to believe that BP, a British company working in our Federal waters, controlled by our Federal Government… that BP makes the decision to use whatever chemicals they choose, and that BP refuses to tell healthcare providers the chemical content of those dispersants? According to our Government, what Ms. Kennedy is saying is blatantly false. So we’ll just need to look deeper into these Corexit dispersants. JoAnne Morreti and her research team discovered some interesting facts about the money flow and individuals who stand to benefit greatly from our Government’s selection and use of the Corexit dispersants. Also note the use of Corexit is banned in Britain. “The real money is in the use of dispersants. NALCO is associated with UChicago Argonne program. UChicago Argonne received $164 million dollars in stimulus funds this past year. UChicago Argonne just added two new executives to their roster. One from NALCO. The other from the Ill. Dept of Education. President Obama owes the American people answers regarding why he authorized the use of Corexit, and why he has imposed a media blackout in the Gulf of Mexico. We should all be asking the President about this, and certainly asking Kerry Kennedy why she would make false statements regarding the largest environmental disaster our country has ever faced. Some of you may have gotten an interesting email recently explaining how the U.S. 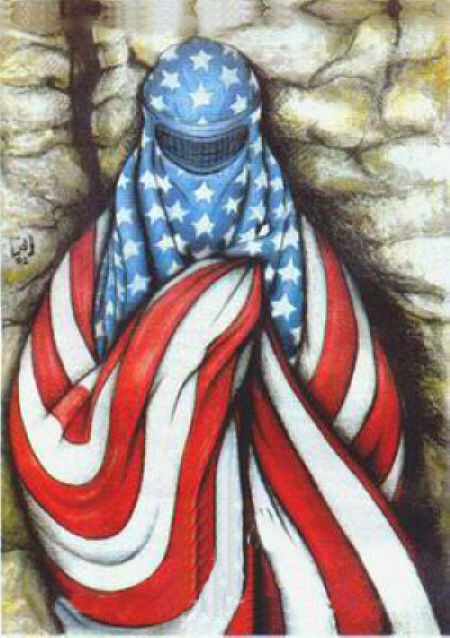 Postal Service recently issued a stamp honoring Islam. There was a picture of the stamp along with a request to boycott it and notify all your friends to boycott the stamp. I looked up the stamp on Snopes.com history on the Islamic Stamp to see if there were any listings to back up the validity of the email; amazing what you can find with a few clicks on the internet. 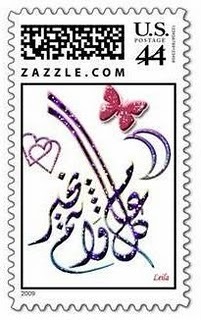 Yes, there is a stamp commemorating two Islamic holidays; but it’s not the one pictured in the email going around. 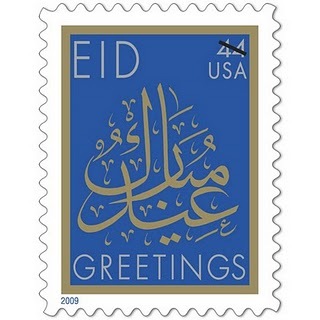 The genuine “EID” stamp has been around since 2001 as a $ 0.34 cent stamp; but had recently been upgraded to first class rate. Well I’m glad they cleared that up, being dyslexic and misplacing the letters I thought we were celebrating the placement of Improved Explosives Devices. Islamic terrorists like to leave IED’s on the side of the road for unsuspecting troops. Instead of shouting “Eid Al-Adha”, these folks shout, “Allah Akbar” as American body bags are filled. Maybe if we get some conservatives elected we’ll see yet another new stamp, the “EIB” first class stamp celebrating the “Excellence In Broadcasting” golden microphone used by Rush Limbaugh. Can’t you just see some leftist having to lick that stamp as he/she writes a letter to the FCC demanding the Fairness Doctrine be reinstated; that would be fun to watch. I read through the history and found something else of interest, Eid Al-Adha commemorates the willingness of the Prophet Abraham to sacrifice his son Ishmael in response to God’s command; notice the difference? Christian scriptures record that Abraham sacrificed Isaac, not Ishmael; so what’s the big deal? Ishmael was the son of Abraham’s concubine/servant Hagar, an Egyptian. Ishmael is recorded as a “son of the flesh” while Isaac was born of Sarah, Abraham’s legitimate wife. Isaac carried the Jewish lineage as “the son of promise” or “heir of promise” as Abraham’s “only son” and is referenced as a similitude of things to come regarding the Lamb of God when Abraham offered him up to be sacrificed. Why is the distinction worth mentioning; is it all that important who was taken up into the mountain to be sacrificed, Ishmael of Isaac? The answer has to be a resounding, yes! Isaac, “the son of promise”, represented the Lord Jesus Christ, the only begotten of the Father, a worthy sacrifice. Ishmael, “son of flesh” on the other hand represented the carnal man, unworthy to portray such a demanding role. The Koran has several vague references to Jesus as a great prophet; but relegates Him to a lesser role than that of Savior, Messiah or Only Begotten of the Father. Islam’s Mohammed made sure to downplay the Judeo-Christian scriptures in order to make it appear he was equal to or even more important than Jesus Christ. Sorry folks; Mohammed doesn’t hold a candle to God’s only begotten Son. Our Declaration of Independence makes reference to Jesus Christ, the Word, calling Him the Creator. I don’t see much point in belaboring the issue as to whether we call Him God, Our Savior, Councilor, the Prince of Peace or Jesus Christ; this nation was of His design and creation. Our society has been built upon a strong foundation, one which inseparably connects us with our biblical history, a history which foretold the sacrifice of our Savior through the telling of Abraham’s “son of promise”, Isaac. If we should ever set this important link aside we then forfeit the blessings of life, liberty and the pursuit of happiness as unalienable rights; opting instead to accept something much less. I refuse to accept the alternative, that rights are granted to men through government; for if that’s true then we must also accept that government can take away the right to life, liberty and the pursuit of happiness. I really don’t like the EID Islamic stamp, something about it makes my skin crawl; don’t think I’d ever buy one, not even on a dare. I like the Liberty Bell postage stamp, the one they call the “forever” stamp because its value keeps pace with inflation. Our Independence Day is just around the corner, let’s celebrate American exceptionalism (my dictionary claims there’s no such word) and our inalienable rights as granted by our Creator. The Deepwater Horizon drilling disaster in the Gulf has been headlining the news for nearly two months. You might recall an advisory report submitted by oil industry specialists a couple of weeks ago, a report which was altered after it had been signed by the experts. Obama and Interior Secretary Ken Salazar put a moratorium on off shore drilling for at least six months contrary to advice offered by oil industry specialists who recommended just the opposite. There’s a new twist in the opportunity to take advantage of this “crisis” according to a story by Jennifer A. Dlouhy, Washington Bureau, published in the Houston Chronicle. The latest attempt to pull the wool over our eyes will make it clear that drilling for oil is harmful; all the experts for this new panel were hand picked environmentalists, tops in their field. The final draft of their investigation and report was being placed in a binder prior to the panel being assembled; at least that’s my own opinion. Why bother going through the motions of an investigation; panel membership qualification started with showing their Sierra Club card. A conflict of interest; you don’t say? This sounds more and more like “Climategate” everyday; data being “peer reviewed”, as long as those peers had signed onto global warming’s agenda. There’s an advantage to stacking the deck, Obama and Salazar won’t have to alter the report after this one’s signed. You can bet the final result will be a death sentence for drilling oil and our economy. In other news; it’s been reported the Obama administration has begun an in depth investigation of the Church of Jesus Christ of Latter Day Saints’ claims that the Book of Mormon is the word of God. Several theologians, tops in their field, allegedly are being assembled to form an exploratory panel at this time. Complaints from local ministers abound regarding young men on bicycles spreading the “Fullness of the Gospel” in predominantly Southern Baptist communities causing unrest and even membership loss. An unreliable source from inside Obama’s administration, the same source who promised to authenticate Obama’s live birth certificate, leaked rumors of the investigation, code named “Golden Plate”. The investigation was to be completed by July 24th to coincide with Pioneer Day. These religious scholars have been asked to debunk the “Joseph Smith Vision and associated cult”. While confidential at this time, the panel has members of many denominations; Baptist, Methodist, Catholic and Presbyterian. “Can you believe those Mormons have the nerve to call themselves Christians”, one minister was overheard as he exited the closed door meeting. Not one member of the LDS Church (Mormons) had been invited to sit on the panel; but why complicate things? The one sided panel is similar to there being no oil and gas experts involved in the investigation of the Deepwater Horizon accident; but this is only a rumor. It’s About Time the Government Created an Agency to Look Out For Us! Letter Re: The 50 States are Getting Desperate for Revenue!